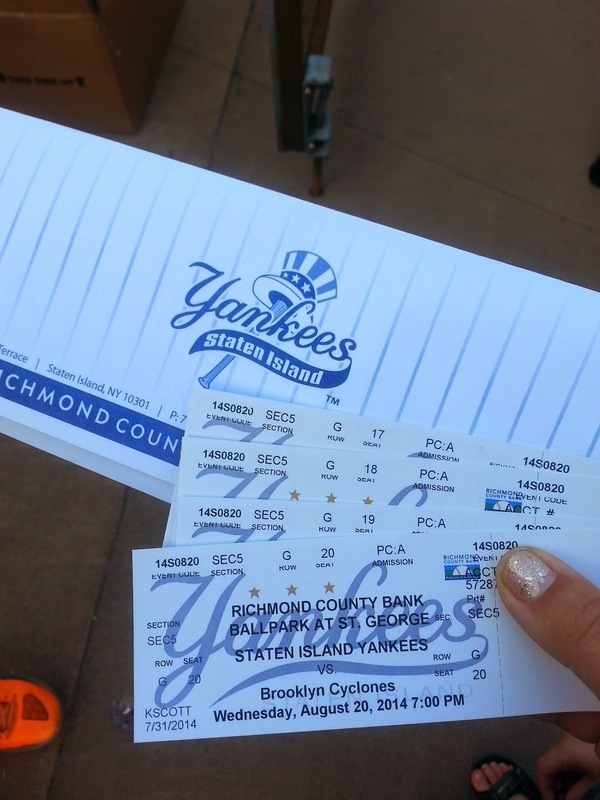 We were invited out to do a Staten Island Yankee Game Review this past week. If you follow me on Instagram you might have seen a few pictures here and there. 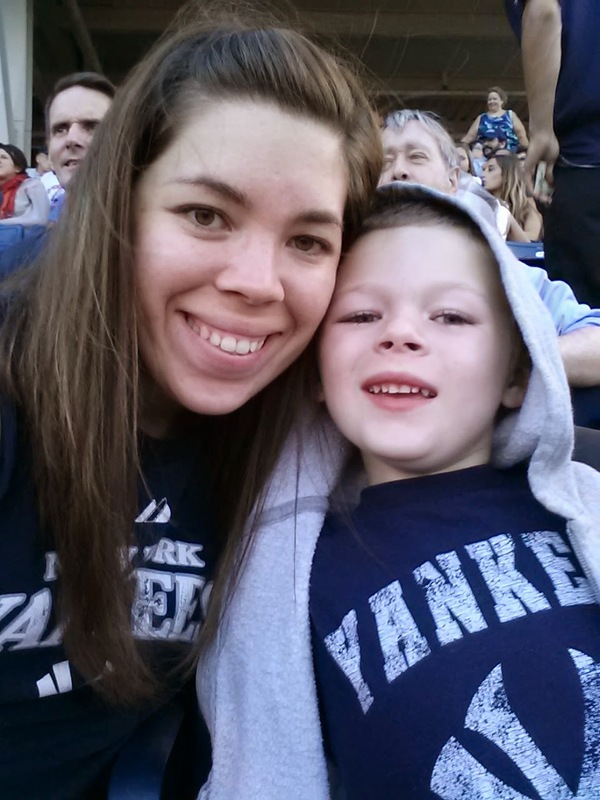 We were super excited to watch a baseball game with my five year old who has taken a real interest in the sport! We were given some complimentary tickets along with food gift cards! The first thing Mac saw was these huge bounce houses. Since they were FREE we did let him jump around for a few minutes. This is great for little ones who need to be worn out before sitting for long periods of time. While entering the ballpark a gentleman who purchased tickets online had a memorabilia bat. He handed it to Mac and said here kid keep it. 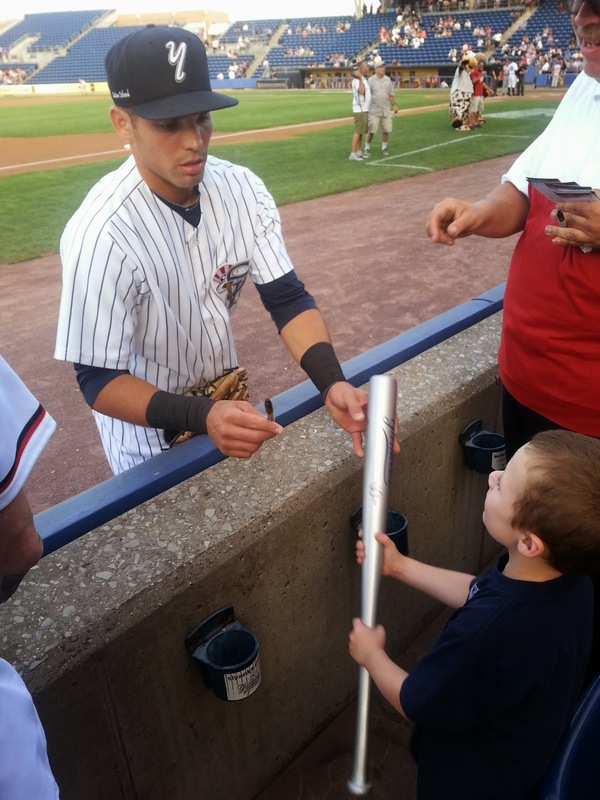 My five year old took it right down to the field and started having it signed by players. This field has such a great setup you can easily do this even if your seats are not close to the field. What baseball game would be complete with out ballpark hot dogs? I don't know about you but I am all about keep old traditions alive and passing down this tradition to my son! 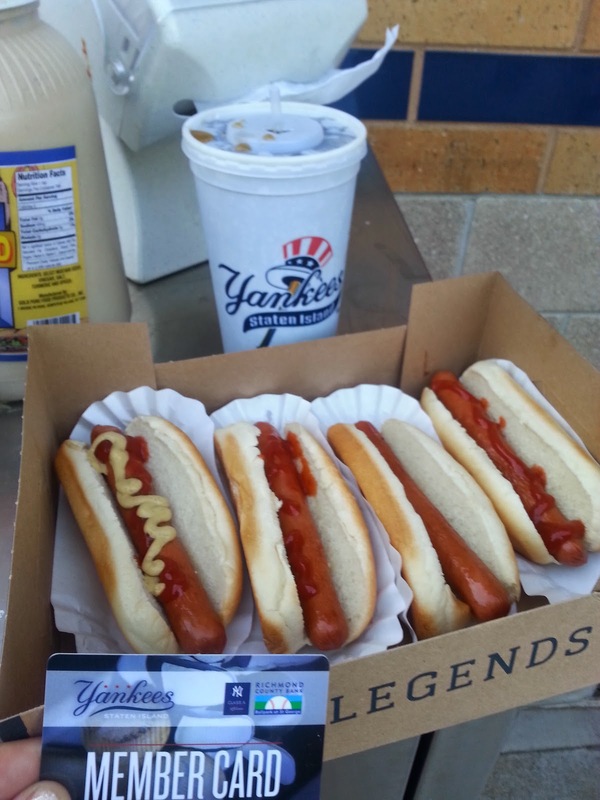 We enjoyed these hotdogs along with a fun Yankees keepsake cup! The Richmond County Bank Ballpark sits right by the bay. We could see the Staten Island ferry coming and going before the game started. Although as soon as the game started we were all routing for our beloved Yankees to win! Side note to parents the ballpark as I stated sits next to the bay. Bring some hoodies, sweaters and maybe a blanket. The wind does pick up and in the evening hours it cools down quite a bit. The field, ballpark and restrooms were so clean. I was rather shocked by this since Games run all summer: from the beginning of June until the first week of September. The minor league experience allows families to enjoy an outdoor activity that is convenient and cost effective for the entire family. Which I have to say is very true. You can find tickets for games in a variety of locations on the cheap side. I have a discount code myself use "Mommy". The Richmond County Bank Ballpark is a short commute from the surrounding boroughs and northern New Jersey. We drove in from NYC and had the GPS take us a back way. I have to say it was a rather winding set of roads. But we are not from this area so on the way back we took some locals advice and it was a much easier route home. I thought the setup of this game was perfect. The entertaining mascots kept Mac very entertained and happy. He sat for practically the entire game excluding food and bathroom runs! That says a lot for a five year old watching a game that lasted several hours long. Did I mention our team WON! They also gave him a game ball signed to him! These types of things just do not happen in major league games without a lot of finagle. What we enjoyed: Clean ballpark, easy parking ($7), easy access to player, inexpensive tickets & food. Sounds like you had quite an experience! Your boy looks so happy in the last pic, he's practically glowing! Looks like you all had a fantastic time! Love your photos especially the one of the hot dogs. Haven't had any in quite awhile and they look yummy!